Student goes face to face with some of the world’s most innovative software developers, winning a conference scholarship to Apple’s HQ, San Francisco. 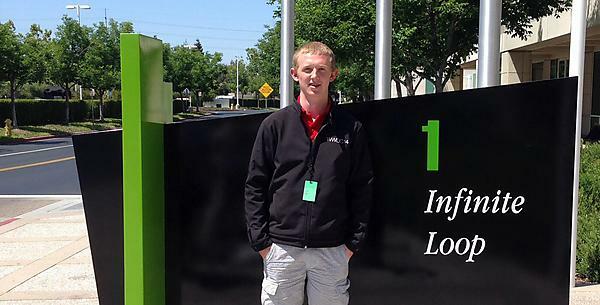 BSc (Hons) Computer Science student Josh Bruce, 20, was one of just 200 students globally to win a chance to be at the Apple Worldwide Developers Conference (WWDC) 2014. The week-long event has brought together more than 5,000 of the planet’s top IT developers, and was used by the company to reveal its latest technological innovations to the world’s media. To win his scholarship Josh, a former Fowey Community College and Cornwall College student, had to create his own interactive CV which was then pitched against thousands of similar entries from budding computer designers around the world. Before coming to Plymouth, Josh had already set up his own web development company – Surftrack – through which he has worked with clients across the UK and in the US. And after attending the conference this week, he plans to use his time in the United States to increase his expertise and contacts, having himself set up a series of meetings with some of the top software developers in the California area.